MEET DETECTIVE RACHEL KING IN THIS BRILLIANT NEW CRIME SERIES. DISCOVER A BRAND NEW MYSTERY FROM #1 BEST-SELLING AUTHOR HELEN H. DURRANT THAT WILL HAVE YOU GRIPPED FROM START TO NERVE-SHREDDING FINISH.A young man’s body is found burnt and tortured by a Manchester canal. He was a journalism student who told his friends he was working on a big story. His death leads the police on a false trail.Detective Rachel King investigates. She has a secret, the love of her life is a well-known villain. He has recently come back on the scene. But what does he really want?A brutal serial killer with a taste for good-looking young blonde men.A student who thinks she has a long-lost brother. But even her own father doesn’t believe her. 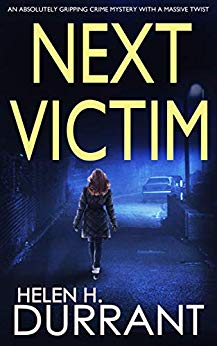 She was involved with the first victim.As the murders continue, can Rachel keep her family together and stop the killer?A RACE AGAINST TIME TO STOP A SERIAL KILLER WITH A HIDDEN AGENDAPerfect for fans of Angela Marsons, Kimberley Chambers, Damien Boyd, Rachel Abbott, Patricia Gibney or Mark Billingham.What readers are saying about NEXT VICTIM“I couldn’t put it down.” Barbara“This new series by Helen H. Durrant certainly has got off to a thrilling start.” Viv“If you want a book to get your teeth into, this is the one. A massive 5*” Greta“Another fast-paced murder mystery” Aileen“The writing was top notch and the characters were very real.” KatTHE DETECTIVEDCI Rachel King. Thirty-nine year-old mother of two teenage daughters. Divorced from Alan. She lives in the Cheshire village of Poynton – about ten miles from central Manchester. She is good at her job, gets results but does make mistakes. One of them was getting involved with a budding villain in her teens. No one, family, friends or colleagues know anything about this.